GUMIL Hawaii 36th Anniversary (2006) souvenir booklet is now online. 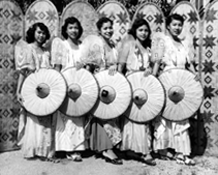 Features the coronation of Miss & Mrs. GUMIL Hawaii, Mrs. Freedom, Mrs. Press and the drama of SAKADA. Held on April 8, 2006, at August Ahrens Elementary School Auditorium, Waipahu, Hawaii: GUMIL Hawaii/36th Anniversary. Piesta Ti Kailokuan (1998) souvenir booklet is now online. Sponsored by Annak Ti Kailokuan Iti American (AKA), Piesta Ti Kailokuan featured the coronation of Miss & Mrs. AKA (Annak Ti Kailokuan Iti American) and the dramatization of the Life of Juan Luna y Novicio. Held on Friday, September 25, 1998, at Farrington High School Auditorium, Honolulu, Hawaii: GUMIL Hawaii/Piesta Ti Kailokuan. 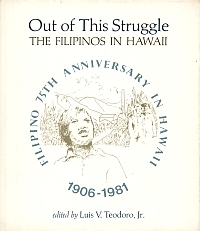 The Filipinos in Hawaii: An Annotated Bibliography, written by Ruben R. Alcantara with Nancy S. Alconcel, John Berger and Cesar Wycoco (University of Hawaii, 1977), is now available online in a single PDF file. Due to changes in priorities in the FilCom management, eFIL will be moving its work area to a new site. eFIL will continue to partner with FilCom in developing FilCom's Family Legacy Project and hosting the Project's records, but eFIL will make its next move to be more fully "virtual" as a digital archives. We apologize for any temporary glitches in accessing our website during this transition as we move our servers and working equipment to new locations. [update, April 8, 2013] eFIL and FAHSOH webservers have been moved and are fully operational. Work has also been started to upgrade the eFIL website to include a search function -- an addition that will become more important as our collection increases. Gina Vergara-Bautista (eFIL archivist) and Clement Bautista (eFIL administrator) conducted a records/collections preservation workshop for community organizations, Preserving Organization Collections Workshop. 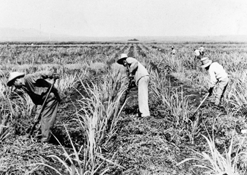 Held at the Hawaii's Plantation Village in Waipahu, the workshop focused on managing, caring for and preserving organizations' records and memorabilia. This workshop builds upon a previous series of workshops focusing on family collections. The following books have been made available in late 2012.